Students in the John Wells Division of Writing for Screen & Television regularly enter screenwriting contests. So, when senior Stanley Kalu saw an email announcement for The LAUNCH, a writing competition with a million-dollar prize, he knew he had to enter. “I heard about The LAUNCH through the Office of Industry Relations. They send us regular emails about upcoming festivals and competition opportunities,” says Kalu. Sponsored by JRU Studios LLC, in partnership with the screenwriting website Screencraft, The LAUNCH offered at least one million dollars in film financing and a $50,000 education grant to the winner. The competition was only open to students enrolled in an accredited institution, although they could be from any country around the world. It was underwritten by philanthropists Chuck and Marni Bond, who wanted to support college students in the Arts. 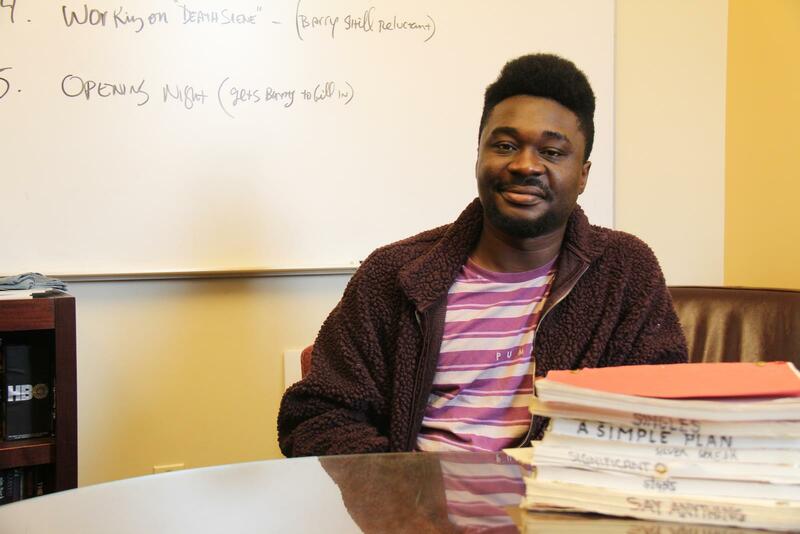 Like every other upperclassman in the Wells Writing Division, Kalu had a finished script he could submit: The program requires students to write a full-length feature by the end of sophomore year. Titled The Obituary of Tunde Johnson, Kalu’s story is about a wealthy black high school senior who falls victim to police brutality. Kalu, who is an international student at SCA, was born in Nigeria and grew up in several African countries. By the time he came to Los Angeles he had experienced many examples of black culture. Still, having never lived in a country where he was a minority, he was shocked by institutional racism in the U.S., particularly around the issue of police brutality. At the same time, Kalu observed that the LGBTQ community was more accepted in America than anywhere else he had lived before. The juxtaposition of these experiences plays out in his character Tunde Johnson’s story. The Obituary of Tunde Johnson is already in development, with production beginning at the end of October. Having a film in production while you’re still juggling school is not an easy task, but Kalu’s professors are helping him figure out the balance. "We're proud of Stanley and all the hard work he has done to reach this point,” says Professor Jack Epps, who Chairs the Wells Writing Division. Another SCA Writing student, Sammy Sultan, placed 7th in The LAUNCH completion with a script titled Felix's Bar Mitzvah. “Our students excel because of the extensive training they receive to create, develop and write professional caliber screenplays as part of our curriculum. They are taught by professionals to be professionals,” says Epps, adding that The LAUNCH seemed like “a great platform to enter the Industry."